Fellow bloggers...is growing your Twitter followers one of your goals? If you are struggling to get more people to follow you, then I have some tips for you! Today, I'm going to share 5 ways to gain more Twitter followers based on my own recent experience! 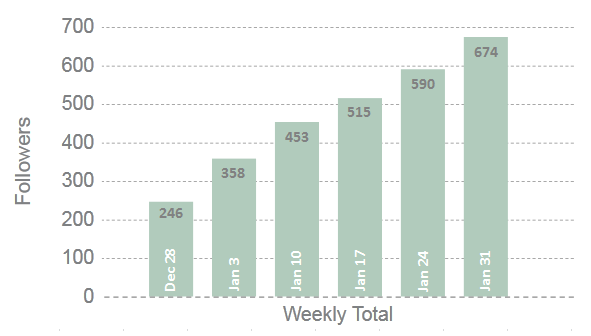 For 2015, one of my blogging goals is to get out there more, connect with more readers and fellow bloggers, and bring more traffic to my site. There are many ways to go about doing this, but one of the best ways is to take advantage of social media! Social media is an excellent way of getting your name out there and meeting new people. Another awesome benefit is finding other cool bloggers and the things they write about! Not only can you learn from your fellow bloggers, you can also be inspired with new and fresh content for your own blog! Since there are a number of platforms out there, it can easily get overwhelming pretty quickly. Each one has their own unique qualities and can even appeal to different audiences, so it's up to you to pick the ones that work best with your blog and brand. If you're just starting out, the goal should be growth and engagement. This is exactly where I am right now and while I still have a lot to learn and a long way to go, I thought it might be helpful to share a little of what I've learned that has worked for me in hopes that it might help some of you! My plan this year is to focus each month on a different platform. I'll still be involved with the others, but I'll really put forth a lot of effort into a specific one with the hopes of significantly boosting my followers and getting the most out of the platform for that month. For January, I focused on Twittter and I definitely made good progress and learned a lot in the process! I initially outlined my plans on December 28 in preparation for January 1. I was tad eager, so I started a few days early (which gave me 5 full weeks to reach my goal). My Goal: To double my followers in 5 weeks! I not only MADE my goal, but I BEAT it by 27%!! #1 | Follow, follow, follow, and follow other tweeps! This is really key...if you follow people, they will come. Will everyone that you follow return the favor? Sadly, no. Should you blindly follow people just to get new followers...I'd say no, but I guess that's personal choice. I had read some advice that basically just recommended following anyone and everyone just to get them to follow you back. Sure...this works. And if you want to do that, knock yourself out! Just be prepared to have tweets that would be relevant to you and your blog lost in all of the noise from folks that you have no interest in and will likely never connect with. I preferred taking the route of looking for other tweeps that either I was genuinely interested in their content/blogs, or I felt would be an ideal reader for my blog. Could I have gotten even more followers had I just blindly followed anyone and everyone...absolutely, but personally I prefer quality over quantity. 1. Look at those who follow you, check out who follows them, and follow those that interest you. 3. Use justunfollow.com...this handy dandy website allows you to enter hashtags or fellow Twitter names to 'copy' followers. It doesn't blindly copy their list, it's just basically another way of looking at who is following specific people to find those that may be interested in your blog. From justunfollow.com, you can follow new people, unfollow people, and even see who you are following that isn't following you (just in case you want to clean up your feed so it's not so overwhelming with tweets!). Good Idea: Make it a point to follow new people every single day! Tip #2 | Tweet, tweet, tweet, and tweet some more! Ok...I don't say this to encourage you to over tweet, but you need to be tweeting if you want engagement and potential followers! A lot of people are following thousands of people. They're obviously not on Twitter every single minute of every single day, so they will not see all of the tweets from the people they follow. If you tweet that a new blog post is available...you need to do this several times during the day (and possibly even in the days that follow!). Also tweet about what's going on with you during the day. People want to see more than just blog updates on your feed. Give people something that will help them engage with you! With that said, DO NOT make the majority of your tweets about you! Retweet other people's tweets, share other people's blog posts, tweet out helpful articles that you stumble across, etc. Good Idea: Create and use lists! I have several lists for the different blogging groups I belong to. Usually during the day, I will go to one of those lists and scroll through to see what my fellow blogging tweeps are tweeting. It doesn't take me long to find a tweet to retweet or a blog post to share. This will help you engage and network with other bloggers! If you are sharing blog posts, both new content and old content, scheduling your tweets will be a lifesaver! I happen to like Buffer App but there are a lot of options out there. Whatever platform you choose, the premise is the same. Write up your tweets, add in a link (if necessary), hashtags, and then set a date and time for it to automatically tweet! As soon as I finish writing my blog posts, I schedule those to go live within the next week. I then create a shortened link through bitly and I schedule all of my tweets to promote my new post right then. Even if you are scheduling tweets, don't let the scheduled tweets be your only tweets. Mix it up with a few on the fly tweets or share a photo! This will keep your feed fresh and interesting. Good Idea: Use a Twitter Schedule to stay on track of your scheduled tweets and to be sure you're varying your content! It doesn't matter how crafty or clever your tweet is if no one is seeing it! Make it more likely that others will see your tweet (and ultimately follow you!) by adding appropriate #hashtags. People will search on hashtags to find relevant tweets to either retweet or engage with, so think about good ones to add to your message. Good Idea: Topsy.com is a great website to search on potential hashtags to see how popular they are! As I mentioned in Tip #1, if you're hunting around for people to follow, the only way to assess if they would make ideal readers for your blog is by reading their profile bio. Therefore, if you want people to follow you, make sure your profile bio is informative while showcasing some of your personality. As I scanned potential people to follow, I can't tell you how many profile bios were ambiguous or blank! And you know what...I skipped right past those! It clearly shows my interests and what I will likely tweet about as well as showing my positive outlook on life! Good Idea: You can include #hashtags in your profile sentence to help people find you even more easily (I haven't done that yet, but will update my profile sentence to include these soon!). Now that we've talked about the 5 ways to gain more twitter followers, let's quickly talk about how to pull this together and make it happen! The best way to motivate yourself is to give yourself a specific number of followers to reach by a specific day. Write it on a post-it note or an index card and put it where you can see it to keep you motivated every day! Based on how many new followers you want, divide by the number of days you’re giving yourself, and then be sure to follow at least that many every single day! Not everyone will follow you back (I'd say it's less than 40% will actually follow you back! ), so padding this with a few more will help you better achieve your goal. I didn't quite meet my personal daily quota of follows...let's be honest, there are only so many hours in the day! But, I still succeeded in meeting my goal, so I'm perfectly happy with that! As I found other great articles for growing your Twitter account, I saved them to a Pinterest board. If you'd like to check those articles out, then just hop on over to my board! Throughout this post, I've shared a few helpful websites, but I have two more! Tweriod will tell you when is the best time to tweet based on your followers! To get the most visibility for your tweets, you will want to tweet when your followers are active on Twitter. With a free account, they'll compile a report for you every month and it will show you the most active times for weekends, weekdays, etc. You do have to request the report and unfortunately, it doesn't show you the results right away, but you will get an email when it's ready to go. 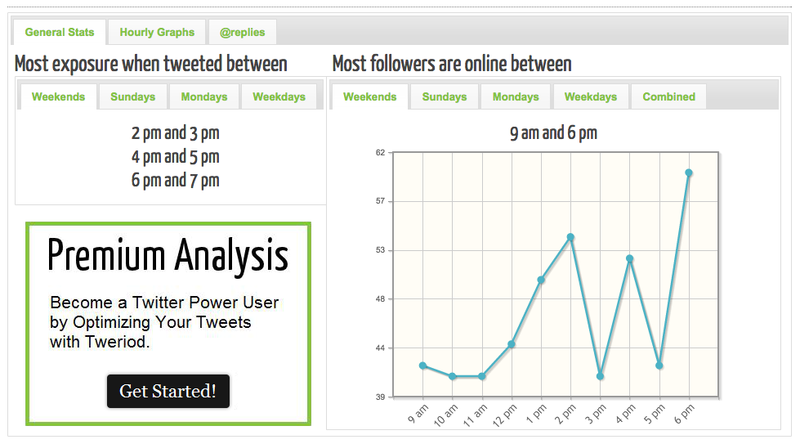 You can analyze your tweets with Twitter Analytics. This will show you not only which tweets had the most engagement, but it will give you some info on your followers - demographics, interests, etc. Your turn friends! What is your advice for making the most out of Twitter? Did any of these resonant with you? Do you have any other suggestions to add to the list? Leave me a comment and let me know!! Can YOU Love Yourself Better?